Inserts can either be incorporated at the time of the moulding process, or be inserted as a post moulding operation. When incorporated as part of the moulding process, the inserts can either be loaded by robot assistance or by the process operator. If the inserts are applied as a post moulding operation, they can usually be applied any time after the moulding process. In some cases, they are inserted as part of a series of post moulding operations. This helping to minimize the actual cost of insertion. The fundamentals of process speed (and economics), and process repetition must be borne in mind when making the decision when to apply the insert. It is not good practice to allow the cycle time to vary from shot to shot; this can have an adverse effect on the quality. 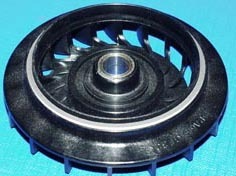 Most thermoplastics can be processed with the use of Inserts. The table below lists some of the commonly used materials. 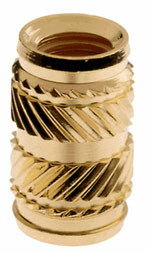 Where higher thread strengths than brass would provide are required, a stainless steel insert can be used. Although the higher costs of machining SS have to be borne in mind. Over the years many variants (and patents) have been developed. They specifically relate to the plastic material in use, the moulding process, and mode of insertion. One main derivative of insert is that used in the Glass Reinforced Plastics (GRP) industry. Most inserts are made from metals, usually brass, which is a harder and more durable material than most plastics. In threaded inserts, the higher tensile strength of metal is the main reason for the specification of an insert. Perforated plate type inserts, which incorporate threaded parts, allow the plastic resins to flow through the perforations thus ensuring a mechanical bonding with the base material. Special inserts have been developed for use in Structural Foam. Where a higher strength than the base plastic material is required a metal screw in type insert is used. Often the application of this type of insert permits a metal screw / bolt to be repeatedly unscrewed. Where a component assembly calls for plastic mouldings of differing properties of plastics, or where it would be uneconomic to complicate the moulding tool, a separate injection moulding is used as an insert. Perforated Plate Inserts Specialist inserts comprising a base plate of perforated form are used to facilitate a male or female thread. Commonly used in the GRP Industry. By the insertion within the moulding process of metal inserts of specialist metals (Brass and Gunmetal etc) a post moulding assembly is dispensed with. Additional benefits are a strong key to the base plastic. 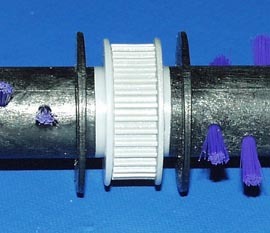 This technique has been developed by the packaging industry and used within the injection moulding process to incorporate a pre-printed plastic film into the moulded article. A continuous roll of plastic film is mounted over the top of the moulding machine and drawn down over the moulding impressions to a bottom take-off roll. The mechanism is indexed in sequence with the moulding cycle. Typical articles produced are moulded boxes for biscuits and crackers. Mainly used in the injection moulding process again by the packaging industry. Robotically placed individual pre-printed decorative labels are loaded during each machine cycle into the mould tool. To assist adhesion during the closing and material flow stages, the labels and tool is electrostatic charged RF Shielding. Mainly used in the Glass Reinforced Plastics (GRP) industry to achieve a barrier layer of shielding against transmission of radio frequencies. The application has uses in machine housings and cubicles housing high security equipment. A matrix of fine metal filament in the form of a non-woven mat is incorporated into GRP moulding. In radio receiving and transmission dishes, (satellite receiving dishes), the random pattern of a non woven mat incorporated into the dish ensures that the frequency of radio waves is captured and reflected onto a amplifier/receiver housed at the focal point of the dish. This is a term used where larger pieces of press tooled metal plates are used as an insert within an injection-moulding tool. By a series of both runner forms and hot tip feed devices, plastic materials are fed to multiples of plastic over-mouldings or "inserts" which are mechanically bound to the press tooled metal plate. Applications include VCR and Camera chassis plates, which require the rigidity and dimension stability of a metal plate, but also demand the flexible and excellent frictional properties of plastic materials. McKechnie Plastic Components is a world leading manufacturer of engineered plastic assemblies, working as a proactive partner with world-wide OEM's in markets as diverse as IT, telecommunications, medical, defence, automotive and consumer durables. The McKechnie Stamford Bridge, Yorkshire, Operation, with its satellite factory at nearby Pickering is a founder member of the McKecknie Plasics Worldwide Grouping. Plastic mouldings are manufactured by the injection moulding process. Additional facilities include the post moulding operations of Decorating and Finishing. Design of the moulded components is undertaken by the in-house CAd facilities.